Eight Passenger Interior is Tastefully Finished in Beige Townsend Leather with Brushed Aluminum Hardware, Beautifully Complimenting High Gloss Veneer on the Cabinetry. Additional Features Include a Forward RH Slimline Refreshment Centre, Forward LH Storage and Entertainment Cabinet, Aft LH Belted Flushing Potty, Cabin Divider with Sliding Doors and Center Aft Coat Rod. All woodwork refinished and seats redyed in 2015. Split base with Matterhorn White on the top and Black Metallic bottom and tail with Strawberry Pearl and Starlight Silver Metallic Accent Stripes. 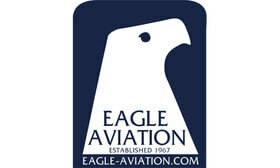 that the Eagle Aviation team will provide you with a professional and gratifying customer experience, time and time again.